Manchester City's Leroy Sane (left) and Rotherham United's Zak Vyner battle for the ball during the Emirates FA Cup, third round match. Pic Martin Rickett/PA Wire. Paul Warne revealed how Manchester City manager Pep Guardiola ignored his pre-match plea to ‘go easy’ on Rotherham in their FA Cup third-round clash on Sunday. The Millers were facing an impossible task against the English champions even before Guardiola named a side that included Raheem Sterling, John Stones, Kyle Walker, Kevin De Bruyne, Riyad Mahrez and Gabriel Jesus. It is little surprise that Warne's men were blown away, though the 7-0 scoreline at the Etihad Stadium was disappointing. “I spoke to him briefly beforehand and asked him to be gentle,” Warne said. “Then afterwards I just shook his hand and told him his team are a joy to watch. 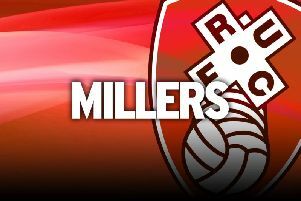 The Millers, whose starting XI all played in League One last season, were chasing shadows at the Etihad against a team that cost almost £400m to assemble. But Warne reckons they can learn something from the day. “Could I ask my lads to give me much more? No I couldn't. The gulf in class is for everyone to see. “It summed it up when I told my right-back (Zak Vyner) to smile with 10 minutes left when Sterling came off and (Leroy) Sane came on. “I am thinking 'Oh my God, they have taken off the English one and put on the German one'. “That summed up the difference in class. I was pleased with some performances and I would like to think the lads learn something from it. “If they do, going forward for the rest of the season it is not a day in their career that is wasted. “They can learn a lot off how good Man City were, how good their wingers' movement is to get on the ball.